Progressive Agriculture Safety Foundation is an international organization and an American nonprofit foundation placed in the top tier of the Better Business Bureau’s accredited charity. What does this mean? They are a transparent organization with most of the money donated going to actual activities for which the money was intended. 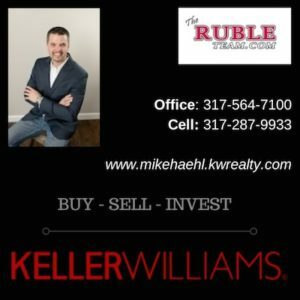 How does it affect us, our communities in Shelby County? It is the backbone of the educational and logistical support for our Farm and Home Safety Day, completed by every fourth grade class in Shelby County this week. You can visit their website at http://farmsafetyday.org/ You will find there the collective deeds of people throughout the United States and Canada dedicated to the health, wellness and safety of your youth. This year they will be celebrating their 20th birthday. Last year they celebrated touching the lives and livelihoods of 1,000,000 children. Purdue Extension, is also celebrating some milestones with them. The Extension Service, as enacted by Congress and implemented by Purdue University (Indiana’s Land Grant Institution), is currently celebrating its 100th year. The Extension Service was founded during a time in our country’s history when there were a lot of scientific discoveries found and quality of life opportunities made that were not making their way out into rural communities. That mission has morphed over time to serve those in need with science-based information no matter the class, race or geographic location. Farm Bureau will also celebrate 100 years soon as an offshoot of the “Extension Movement” from the turn of the last century. 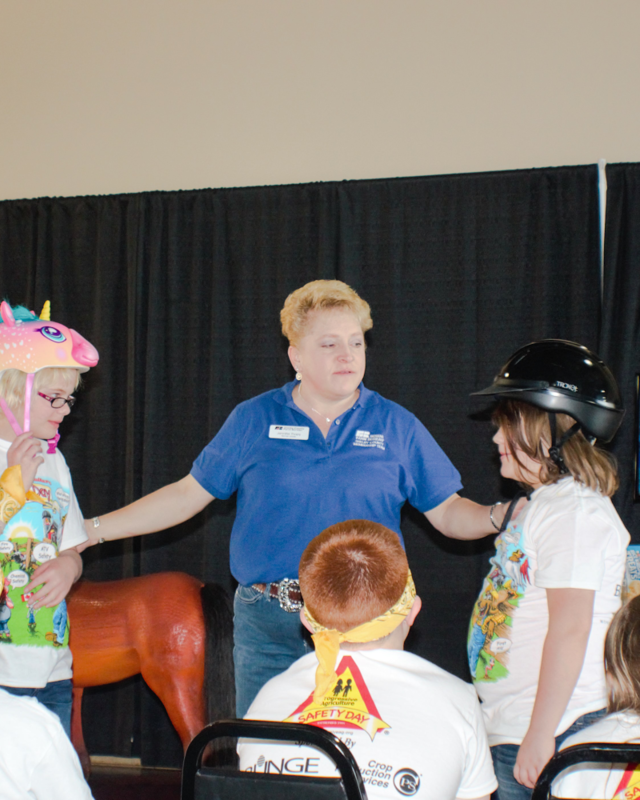 The Farm and Home Safety Days were originally (before our time of implementation) called Farm Safety Day Camps where children from rural communities learned how farm equipment, grain, livestock and other elements they could encounter on the farm endanger them. That has changed too. For Shelby County, we use this opportunity to teach children of dangers they may potentially encounter living in Shelby County. Bicycles, Home Alone, Methamphetamine awareness, 911 dispatch (what to do), home safety plans, look-alike chemicals (accidental poisonings) are a few of the 11 topics we covered. 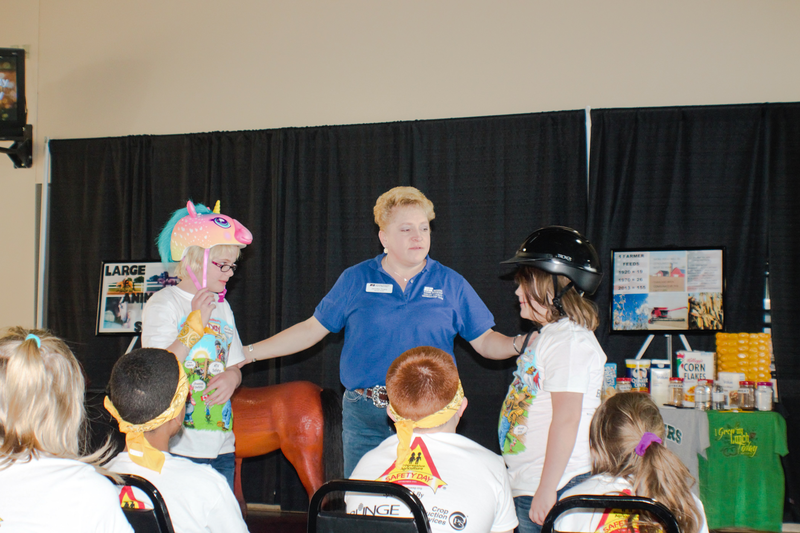 Riding instructor Jennifer Thopy demonstrates to children the difference between a bicycle helmet and a riding helmet. Meth awareness, really? Yes. No longer do you need the facility the size of a still. They (the users/distributors) can make this poison in Gatorade or Mountain Dew-sized bottles. They then discard the bottle in a parking lot, park or throw it in a ditch. Unused residues and chemicals in the bottle are still flammable, caustic AND explosive. I was just required to discuss some of this to my Cub Scouts. It is age appropriate. One of our deputies was even injured by such a device several years ago. It is here, the topic is relevant and our children that volunteer on clean-up crews or even play in a park, become exposed. Which is why we cover the topics. It is why we use some of the best professionals in the field. They are dedicated. For several years one of our own ER nurse’s at Major Hospital has taken her own personal leave to teach the look-alike session. Shelbyville’s bicycle police for the first time taught the bicycle safety session. The Narcotics Division and the Methamphetamine Task Force of the Indiana State Police teach the Meth Awareness course. All of these professionals share a common thread: they all know what happens when children are not aware of the hidden dangers around them. So, this year we celebrate the birthday of an organization that donates $8 per child AND volunteer to make Shelby County a little safer. Local support and donors of the Shelby County Ag Promotion Committee cover the other two-thirds of the expenses. We do it at 550-600 children at a time, every year. Better yet, we’ve done it long enough that the participants are now back as the volunteers. Our exorbitant match, outstanding teaching professionals and participants that are now volunteers are possibly three of the best presents an organization could ever receive. Happy Birthday, to us.